At first glance, it might seem like the High Crosses of Ireland appear absolutely everywhere. There are carved Irish or Celtic crosses at every cemetery on the Emerald Isle - but what really makes one of these symbols a true High Crosses of Ireland? For starters, Irish memorial crosses, Celtic crosses, and High Crosses are seen as representing the same thing, but they are in fact quite different. The genuine High Cross, as "typically Irish" as the (often nearby) round tower in many eyes, are in a category of their own but are usually lumped together with other similar symbols. The Celtic Cross - an Irish Original? A Celtic cross is most commonly depicted as a conventional cross with the stem and arms linked by a circle which is often decorated with scrolls or vines. This specific form of the main Christian symbol was popular in early medieval times and may have had its origin in Ireland, though it also appeared in Cornwall, Wales, Northern England and parts of Scotland - all areas being in contact with Ireland during the so-called "Dark Ages". So maybe this cross, now regarded as something of a Pan-Celtic symbol, came with Irish missionaries? While it is not totally clear if the cross came from Ireland or Britain, the historical development of the unusual style of this cross is even less clear. There is very little hard evidence to explain why the ring became part of the cross. Because it is a bit open to interpretation - some scholars went as far as to suggest that the ring represents a halo, and thus Christ himself. Another competing theory suggests that the circle should really be interpreted as a disk, representing sol invictus, the sun-god. Under this line of thinking, Irish crosses are seen as being closely related to the Egyptian ankh. It is, however, the most simple and practical theory that presents the most likely scenario: namely that the ring was introduced by the masons. Not the Freemasons so forget the conspiracy theories. Rather, it was most likely the stonemasons who added the ring because as craftsmen who carved the crosses, they were probably trying to add more stability to the overall construction. The ring acts to hold up and disperse weight for the crossbar. This theory means that there is no symbolism hidden here at all, but simply a practical solution to make for a sturdier cross. Why were High Crosses Erected? High Crosses in Ireland were built in order to let someone know that they were approaching a sacred space where the inhabitants followed Christian beliefs. Basically, the crosses acted like signs saying "Here are the Christians! ", as well as "This is hallowed ground, please respect that and keep its peace!" Apart from this, the crosses were also gathering points for church events and celebrations. The classic layout of the early monastic settlements included a church, a cross and (if funds permitted) a round tower. The doors of the church and the tower would face each other, with the cross set between them in the middle. Early Irish churches were usually too small for even a modest congregation, which meant that the huddled masses had to attend mass outside, all gathered around the cross. But not all High Crosses were built in front of churches and some seem to have been connected to territorial rights, marking a marketplace, for instance. Others were erected to commemorate an important event or person. There is actually no evidence that High Crosses were used in the early medieval ages as grave markers (but maybe the first one simply has yet to be discovered). No historian can tell us where, when or even why the first High Crosses were erected. However, the most common theory assumes that the first stone crosses were "copies" of wooden crosses covered with metal. Several necessary features of these earlier crosses were then incorporated into the stone design. Some crosses of this type are from the 8th and 9th century, like the northern cross at Ahenny, are covered in geometrical designs. The most important feature was the basic form of the cross itself, which probably evolved out of the chi rho monogram - an even earlier Christian symbol. Later crosses became more pictorial - including the southern cross at Clonmacnoise and the cross of Saints Patrick and Columba in Kells. These became known as "transitionary crosses". This transition from simple markers to engraved crosses later led to the "scripture crosses", literally and liberally covered with pictures representing scenes from the bible. These crosses were had fewer Celtic decorations but included more scenic details in the carvings. These crosses should be regarded as the true High Crosses of Ireland. Today we can still see around thirty of these monuments across the Emerald Isle. 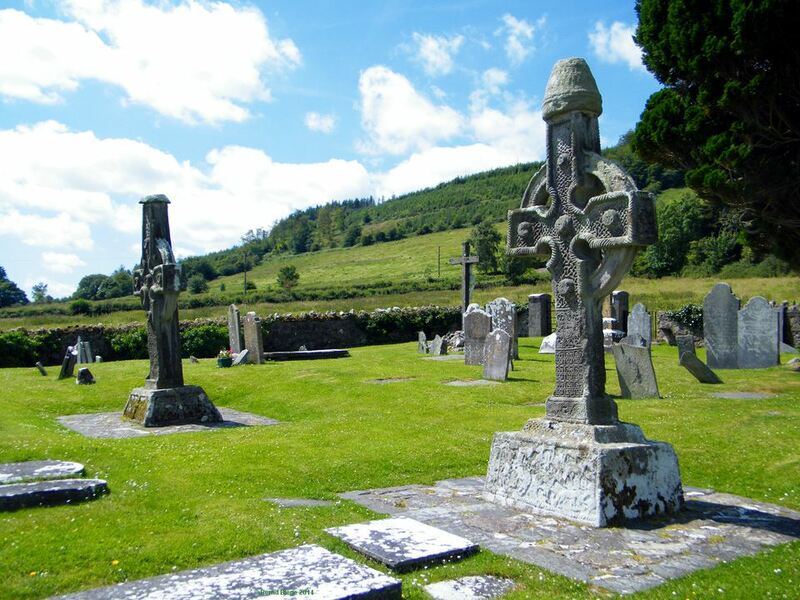 All of Ireland's High Crosses were manufactured in the 9th and early 10th century. The best-known is likely the "Cross of the Scriptures" at Clonmacnoise. The selection of themes represented was fairly conventional and biblical, with a few more fantastical details mixed in. Primarily, the crosses depicted life at a monastery but really centered around illustrating the scriptures. The artists who created the High Crosses (or perhaps the people who were paying them) preferred to show scenes from the Fall of Adam and Eve, Cain killing his brother Abel, the Last Supper and the Resurrection. Some pictures are more generic, like hordes of warriors and even exotic animals (the camel in Drumcliff being a good example). Some of the High Crosses even include some small jokes carved into the stone. Monks would have used these illustrations to make their teachings easier for their audiences to understand because a picture really is worth more than a thousand words. "Sermons carved in stone" is one way these crosses have been described. Crosses manufactured in the later 11th and then 12th century show a decline - ornaments take over again, this time with a distinctive Scandinavian influence, which makes sense since this was the time of the Vikings in Ireland. The crucifixion in gory detail becomes the main picture covering most of the crosses and the mood becomes darker. It was almost as if the craftsmen were declaring that the end of near. Which it actually was - with the Anglo-Norman invasion and the growing influence of the European monastic orders like the Cistercians if Mellifont, the High Crosses simply faded away. Those that were already created were left standing but no new ones were added after this time. A typical High Cross was built in three, sometimes four parts - the bottom part being a very large, conical or pyramidal base. Into this, the shaft of the main part of cross was slotted. This was then crowned by the cross-head (the portion with the arms and ring) - and in most cases shaft and head were manufactured in one piece. The whole High Cross was then topped by a capstone, most of which are lost today. The actual manufacturing process seems to have been undertaken in distinctive steps, the cross being raised on the spot where they would ultimately stand before the finer carvings were completed out in the open. An unfinished cross at Kells demonstrates this theory - the areas where fine detail would be added are still blanks. This also makes a lot of sense because imagine raising a finished, finely carved cross, only to have it fall over and break due to sloppy groundwork. One curious and little-known aspect of the High Crosses deserves mention - the crosses were not only freshly carved during their heyday, they also were painted in quite bright and eye-catching colors. Because they are plain gray stone now, it is hard to imagine this today, but they would have been real attention-grabbers in medieval times. The Irish National Heritage Park near Wexford has recreated this, only to have the colored cross greeted with skepticism by visitors. The worst enemy of Irish High Crosses were neither Vikings raiders nor Puritan zealots - but simply the Irish weather. Most crosses were made from sandstone. Easy to work with, and capable of achieving incredible detail, but not the stuff to survive centuries of rain and wind. And if a cross toppled due to the boggy ground giving way, the usual outcome was for it to shatter into several pieces, leaving nothing more than a richly carved jigsaw puzzle. As these dangers are still ever-present (and pollution takes a further toll), some crosses have had to be removed and replicas erected. This is a good solution for the sake of preservation, but visitors might want to check to see if they actually photographed the original! Worse are well-meant but often terrible "renovations". Slapping on the thickest cement might 'protect' the structure but somehow detracts from fine carvings. And the combination of parts from obviously different crosses also fails to satisfy. Other attempts to protect crosses are well-meant but somehow optimistic - a cross in Kells is protected from rain by a small roof, but a sheer endless stream of 18-wheelers rumbles by a few steps away. Is it a High Cross or ...? Even high-profile publications on Ireland manage to label normal, modern cemetery memorials, carved on an industrial scale all over Ireland, as "High Crosses". Every Irish churchyard or cemetery will have one of these. A cross of fair height and the Celtic pattern - a high cross, but not a true High Cross. The illustrations are totally different and the modern crosses are markers for individual graves, not for holy places or sermons. Modern monuments to mark special places and/or events are also often based on High Crosses, both in size and the basic layout. Most have geometrical designs or knot-work, often reflecting a mixture of Celtic and Scandinavian influences plus a good helping of romantic "typical Irish" designs. Most of these monuments are easily recognizable though some creep up as original High Crosses in some publications. In short - anything younger than 800 years should not be regarded as a genuine High Cross.